So today, I woke up in Edinburgh, and it felt very good. Until I stared out the window, and realised that my decision to bring two umbrellas from London was probably a correct one. Nevertheless, I ventured on the long walk from Queensferry Road to Bristo Square to take in Edinburgh Fringe central for the first time this year. And what a sight it was. I think. I don’t really know anymore. This is the only time I see Edinburgh now, so it’s normal for a giant purple cow to be there, and for pictures of strangers faces to be posted on every wall, while huge tents are erected in what’s supposed to be a university establishment. Excitingly, I spotted the first signs of Laugh Out London’s invasion of Edinburgh taking success, thanks to Jigsaw kindly putting up our kind words about them on their poster (see top image). More excitement was to follow, after I picked up Laugh Out London’s media pass, meaning we get to hang around with Robin Williams and snort coke round the back of the Pleasance. I then ventured into the Mile for the first time this year, and was only flyered twice. Disappointing. Was expecting a lot more. Lazy wet students. I did stop for a bit and listened to some pelt out a song about AIDS from Rent, so that was nice. 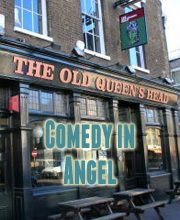 Next up was a lovely chat with Sad Faces (1pm, Underbelly and one of our sketch recommendations), which you can hear in the podcast, before heading off to my first show of the Fringe – Phil O’Shea (Belushi’s, 3.40pm, free). Not only was this the first show I saw at the Fringe this year, but it was also the first one I was in. I won’t tell you what part I played though so not to spoil it, but let’s just say I left covered in butter. I then bumped into Adam Larter (one of our free recommendations) before joining him for a surprisingly delicious vegetarian curry at some place near his venue. He wore a hat. Go see his show, like I intend to some point this week. The greatest moment of the day came when I spotted a poster for the return of my favourite performer from last year, Olivia Rhee. 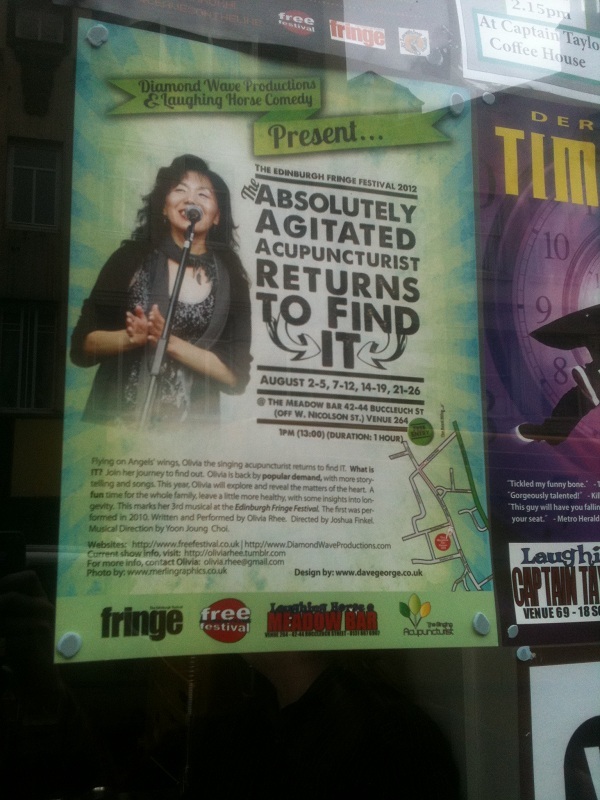 In 2011, she enthralled all with her one woman show the Absolutely Amazing Adventures of the Singing Acupuncturist and now she is back with the Absolutely Agitated Acupuncturist Returns to Find IT! I’m pretty certain IT doesn’t stand for Information Technology in this context, but that doesn’t make me any less excited to see this show about one Korean-American lady trying to fulfill her dream of becoming a musical star. She’s at the Meadow Bar at 1pm, and it’s free, so go go go. Next up was more chats with Checkley and Bush (podcast coming soon), before my second show of the Fringe – the excellent Thomas Hardie (7.3opm, Voodoo Rooms, free). Then, a brief interview with Caroline Hardie on a chaise longue before battling the rain to bring you this nonsense. I hope you’re happy. Because I am. Shows seen so far: Two. Which means an average of one per day. Which is quite rubbish. Sorry. Celebrity spots: Mark Thomas walking around near Lothian Road. As if he’s not Mark Thomas but someone normal. Slightly gothy/retro looking girls I’ve fallen in love with: Three today, which is okay going I think. Plus another one who I think was leading a ghost tour, so it doesn’t really count.